Cycling Uphill part inspired me both to race some time trials, and start this blog! It is the personal blog of 2013 National Hill Climb Champion Tejvan Pettinger. An interesting collection of training, reviews, race reports, and general musings on cycling in all forms. 'One life, live it!' is Sophie's motto. A lover of challenges, and inspiring other's to challenge themselves too. I stumbled across a tweet from Sophie a few months ago about a challenge of cycling from London to Bristol. A month later, 30ish of us set off at 5am, battling through some of the worst floods in history, with a dozen of us finally making it 12 hours later. Exhausting but epic! Keep up to date with her latest adventures here! 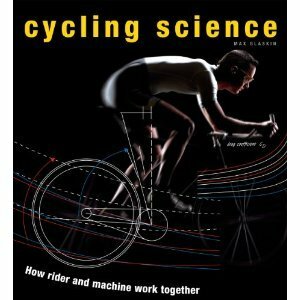 Not a blog as such but the twitter feed of Max Glaskin, author of 'Cycling Science, How Rider and Machine Work Together', a fantastic book, which I must review on here sometime. He links to as many newly published cycling science papers as he possibly can, which is fantastic for those like me who are passionate about cycling, science, and cycling science! There's also a blog at cyclingandscience.com, but the twitter feed is updated several times daily. If you haven't heard of the Velominati, you shouldn't be riding a bike. Well, you may not be adhering to...'The Rules'!. Here you will find 93 rules to ride your bike by, some cynical, some satirical, some downright outrageous, but all hugely entertaining. Rule 5 is generally considered to be the answer to any cycling argument. The Guardian Bike Blog is a good read, providing content from a number of contributors about all aspects of cycling, from commuting to which hotels to stay at if you want to take your bike. It's not updated that regularly, but worth having a look back, and checking from time to time. Maybe they would like another contributor? !